A year ago, SAAMI released an important video concerning ammo and fire. With professional fire-fighters standing by, over 400,000 rounds of ammo were incinerated in a series of eye-opening tests. If you haven’t had the chance to view this video yet, you should take the time to watch it now. Share the post "What Happens When Ammo Burns — SAAMI Video Reveals Truth"
I cry a little for all of the ammo wasted. Ohhhhhh, the humanity … er, ammo! Yeah, not much happens with small arms ammo. Propellant cooks off, pops the bullet out, opens the case up and that’s about it. Even larger stuff (20-30 mm cannon) is pretty boring. Though the HE filled ones can be a bit more dangerous if they detonate, though I did not see any no en-mass detonations. Normally, like the small arms ammo, the propellant fails (cooks off) first, popping the HE head out of the case. Only with some HE fills, or the head gets trapped in the flames, do you get true high-order detonations. Fascinating and very, very reassuring, thank you SAAMI. Thanks for doing such a good job.Keep up the good work. This video will haunt me every time Bass Pro is out of my ammunition. Very interesting! It makes me feel much better about storing ammo in the garage. The sheer number of rounds being destroyed brought a tear to my eye though. I am curious what would happen to rimfire ammo in the blasting cap and bullet impact tests. I would think that it would be more likely to chain react (detonate). It doesn’t look like it was tested here and I wonder why. Perhaps they were not able to get any, just like most of us right now. In responce to John’s Nov. 6th note. I am The Fire Lieutenant / rifleman / Bomb Tech. shown in the film. 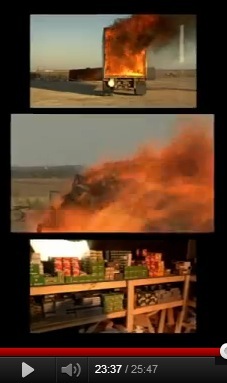 Yes .22 rim fire was used in the film, not in an impact test, just in the burns. I dont think it would have reacted much differntly than the centerfire with bullet impact or blasting caps. I am also a sport shooter and cryed watching that much ammo being destroyed, but it was for a good cause. Wait, diesel fuel can deform steel? That’s unpossible! The 9-11 truthers insist jet fuel doesn’t burn that hot. I had a ” tin ” container of surplus 30 cal ( 1940 to 1945 vintage ) that went thu a house fire, after the fire, the tin had a top seam and a side seam pushed out and busted open and the cartiages inside were ruptured or had the bullets popped out the end. the loose ammo I had there was about the same, ruptured along the side or bullets popped out the end, with a lot of the bullets being from 1 to 2 feet away. 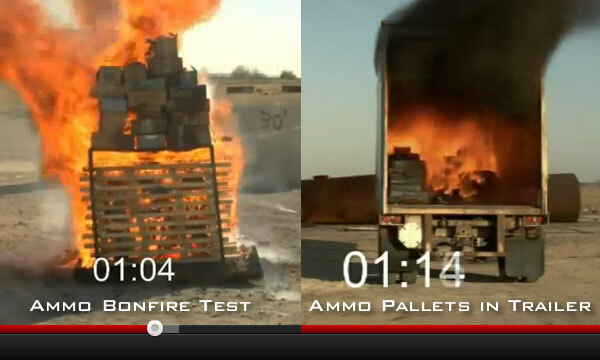 I remember seeing/reading about a test done on burning ammo years ago. The various cartridges were placed in cardboard boxes and then the boxes were dropped into a fire pit. IIRC the “exploding” cartridges didn’t even get through the sides of the boxes. I could have saved them a lot of money. Whenever I burn leaves on my shooting range, there will be a few live rounds mixed in that cook off. Makes you jump, but no real danger. What about ammo stored in an ammo can?